Your evening news was full of news about Seneca on January 26, 2016! 54 Below Zero on February 10, 1933; the coldest ever recorded in the State of Oregon! 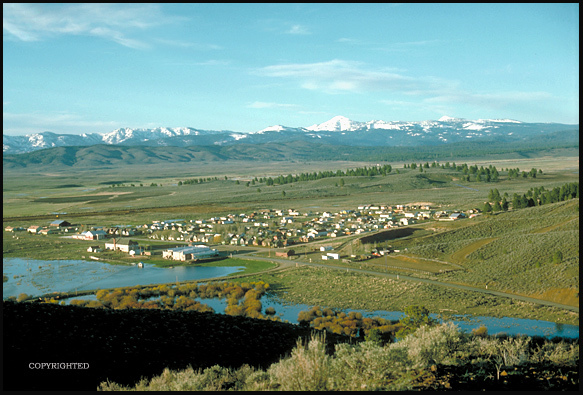 Here is Seneca, perched 4,700 ft. high in its remote mountain valley north of Burns and south of John Day, with Hwy 395 running through its center. These days, it has only 220 citizens, and seemed forgotten by the rest of Oregon until late January of 2016. That was when a dramatic arrest took place south of town on the highway just south of the Joaquin Miller Wayside/horse camp (see picture and facts about wayside here). Ammon Bundy and several of his key people encountered a massive State Police/FBI roadblock on the evening of January 26th. At that point in time, Ammon's armed takeover of the nearby Malheur Wildlife Refuge had been going on for 24 days. It was a self-styled heavily-armed revolt against the Federal government, staged by people almost entirely from outside the State of Oregon. The arrest was marred by the fatal shooting of Lavoy Finicum, who had sped off and attempted to run the police blockade. Ultimately, the occupation lasted 41 days, ending on Feb. 11th, when the remaining four occupiers of the Refuge surrendered to the authorities. (Ammon, son of Cliven Bundy)..... Finally Seneca could relax and go back to business as usual in its high mountain valley. 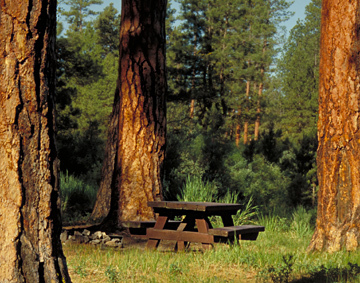 Many decades previous, back in Seneca's glory days, the little city was a company-owned lumber boom town that was linked by railroad to Burns, where the Hines lumber empire of Chicago made its Oregon Base of operations; the prize was the virgin pine forests of the region, especially the magnificent stands of Ponderosa pine around Seneca. The still-isolated little hamlet is routinely Oregon's coldest place, although 99% of Oregonians will NEVER KNOW IT, as its weather news and data are NEVER picked up by the media----- In 1933, a couple of years after the establishment of its official weather station in mid-1931, it recorded 54 degrees below zero during a "Siberian Express" cold wave that set State all-time record low-temperatures that still stand in the Year 2010 as far away as Texas! (see bottom of page for the actual worldwide records of February, 1933)....IIf you are interested in ordering the newspaper story, please click here..... Maybe 1933 will not seem so far away in its historical context: Franklin D. Roosevelt became President of the United States; Adolf Hitler was beginning his rise to power in Germany; and US banks were in an absolute panic over the deepening Great Depression, most of them CLOSED in February while Oregon's temperature record was being set! . In the image above, Spring flooding due to heavy snow melt in the higher moutains makes the village appear abnormally wet. Generally, it has a very cold and dry climate, a lot like Tibet, actually. The Strawberry Mountains rise to 9,000 feet in background. The Logan Valley is about 15 miles to the east, higher, and possibly even colder than Seneca... And, there is a place colder even than Seneca, but it is uninhabited-- it's a small 5,500 ft. valley named Crane Prarie, ten miles east of Logan Valley... It's remote weather station verifies that it is definitely colder than Seneca, at least during periods of stagnating air that typically produce Oregon's record cold nights. (see link to new webpage on this topic just above). While mentioning the topic of places even colder than Seneca, I will mention that Seneca's 54 below was unofficially beaten in 1962 (click for more). Seneca is quite capable of generating a week-long string of 40 below zero nights in any sizeable Arctic cold snap; the last time it did so was in 1989 (the year the Exxon Valdez oil tanker ran aground in Alaska). Officially, Seneca has been down to 54 below zero F; unofficial Old Timer reports from before the establishment of the official weather station recorded 60 below zero in the Big Cold Snap of 1927, and 1924 is also mentioned as a year where it likely was lower than 55 below, and one wonders also about early December 1919, when many records were set that still stand today, eg. Yakima, WA at 24 below on Dec. 13th........Back in 1931 Seneca came onto the weather reporting stage with a bang, and soon was setting State records left and right, eg. during the very nasty winter of 1931-32, where the lonely town was hit with what appear to be four sucessive arctic air invasions... seeing 30 below Nov. 29, more serious cold Dec. 15 where it went to 38 below, then worse yet January 23 at 41 below, and finally a late winter smash perhaps still not equalled in Oregon history, a 49 below on February 14, 1932..... Due to Seneca's known potential to set a new State temperature record even colder than 54 below, the Weather Service in 1995 installed a special type of arctic thermometer at Seneca, capable of reading directly to 60 below zero without error (but will "Global Warming" make this pointless, see bottom of this page). Link to Oregon Climate Service's new webpage commemorating Seneca's records, by George Taylor, State Climatologist, with abundant quotations from my original interviews with Seneca residents, plus historical material. And, Click here to see Seneca's weather station and then meet Howard Lohf, the Seneca Cooperative Weather Observer who painfully measured his record-breaking thermometer with a ruler that morning in 1933-- it had been so cold that the mercury had gone completely off the scale of at 40 below zero! How cold is it in Seneca right now? Click here to enter a National Weather Service (NWS) site that will tell you both the most recent hourly temp at Seneca, and also the previous seven days hourly temperatures.... On the NWS site, you will see an interactive complex map of Eastern Oregon-Eastern Washington. The trick of the map is that only the most major towns are named, so you will need to hover your mouse over the tiny crosses that have temperatures next to them, eg. "30" showing 30 degrees F --- To find Seneca, hover on the crosses south of John Day, and soon you'll see the one showing a box of information about Seneca. Smile, now you're a real Oregon weather nut! This photographer wrote a story for Cascades East Magazine (Winter 94-95 edition) about Seneca's friendly, cold-hardened residents, please visit the Howard Lohf link provided: Howard Lohf. You'll also see the current Seneca weather station and meet the Cooperative Weather Observer Mr. Saunders. "ARCTIC OREGON" -- Speaking of extreme Cold in Oregon, SEVEN other populated spots in Oregon have recorded 50 below zero or worse, two of the most well-known being Meacham just off I-84 in the Blue Mountains, (click link)---- and Ukiah, just north of the John Day region in north-central Eastern Oregon... I have reworked a 1930 weather station map to show their locations, click here... I call them simply: "Oregon's Arctic Kings." For a listing of what I call Oregon's "Arctic Queens," click here. 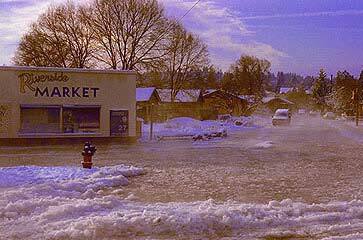 Also, even major cities east of the Cascade Range such as Bend can experience ice jam flooding, such as occurs in really arctic places like Alaska. Here the Deschutes River at Mirror Pond in Bend has ice-jammed and shown the owners of the Riverside Market how accurate they were in naming their business! This was probably the big arctic cold wave of Christmas-time 1983. The gas price on the side of the market reads $1.29, amazing! Speaking of colder yet, take a peek at current conditions at the World's Acknowleged Record Holder, Vostok, Antarctica. Hint: remember that the seasons are reversed if it doesn't seem terribly cold right now-----At over 11,000 ft. on the Antarctic Plateau, Vostok Station holds the World's All-Time record, a stunning 129 degrees below zero F. (July 21, 1983) ...even in mid-summer, it rarely rises above minus 40 degrees! Please click here and you will see Vostok weather for the past several days. On April 19, 2005 it was 87 below zero when I checked, the equivalent of mid-October in the U.S.
February, 1933 was a world-record setting Arctic Express cold wave, with records still standing in 2006! A true "Siberian Express." February 6th, 1933, 90 below zero, still the coldest it has ever been in the Northern Hemisphere!...Located in the heart of Siberia, the village of Oymyakon in Russia is widely considered to be the coldest inhabited place on Earth. A temperature of -90 °F (-67.7 °C) was recorded there back in 1933  the lowest recorded temperature for any permanently inhabited spot in the world. February 7th, 1933, 12 below zero, Salt Lake City, Utah, still the coldest it has ever been on that date. February 8th, 1933, 23 below zero, Seminole, Texas, still the coldest it has ever been in Texas! February 9th, 1933, 30 below zero, Salt Lake City, Utah, still the coldest it has ever been in Salt Lake City! February 9th, 1933, 17 below zero, Spokane, Washington, still the coldest ever seen for a Feb. 9th! February 9th, 1933, 63 below zero, Moran, Wyoming, still the coldest it has ever been in Wyoming! February 9th, 1933, 66 below zero, West Yellowstone, Montana, still the coldest January temperature ever recorded in Montana! February 9th, 1933, 54 below zero, Ukiah, Oregon, tied for the coldest it has ever been in Oregon! February 10th, 1933, 54 below zero in Seneca, officially cited as Oregon's coldest due to Weather Service policy of citing the most recent occurrence of a temperature record..... Meanwhile, in the sheltered Willamette Valley, here's how Feb. 9 and 10 went: Eugene: 11 degrees above zero on Feb. 9, 1933, and 15 degrees on Feb. 10, 1933 (both records still standing). Salem: 13 degrees on Feb. 9, 1933, and 12 degrees on Feb. 10, 1933 (both records still standing, and Salem's records go all the way back to 1893!).... Portland: 1933 temps. unknown, the Weather Service cites records only back to 1940 for Portland, and those records give us Feb. 9 and 10 this way: a puny 25 degree record low for the 9th (in 1986), and 22 degrees for the 10th (in 1982). 1933 did not produce any long-standing extreme cold records at Crater Lake National Park on the crest of the Cascades, some 180 air miles to the southwest of Seneca. However, two Oregon extreme snowfall records were set during the winter of 1932-1933 at Crater Lake. The first --- a monumental 879 inches of snow for the winter season (seventy-three feet of snow, as high as an nine-story building). The second---Oregon's monthly State snowfall record of 256 inches, set during January, 1933. This was just weeks before Seneca was hit with stunning 54 degree below zero temperatures.... Oregon has not seen a winter to compare in the seventy years since then! .... Discussion: El Nino vs. La Nina: Modern science informs us that it is very likely that a strong La Nina was behind 1933's conjunction of severe cold and big snow-making storms in the mountains. To quote from State Climatologist George Taylor "...Extreme cold events occur almost exclusively during La Nina years." In correspondence with him, he stated, "1932-33 was an El Nino turning into a La Nina, much like this year (2007), though it happened in 1932 later in the year. Often those transition years produce the most extreme events." 1933--- a really record-setting year for Oregon... As if setting Oregon's all-time record low weren't enough, Oregon's worst-ever wildfire ignited on August 14th, 1933, the infamous Tillamook Burn..... Related Climatic Note: Oregon experienced a record-setting drought during most of the 1930s, which some claim was equalled only by the terrible drought of the 1840s. The generalized effect of years of drought probably set the stage for the severity of the Tillamook Burn. The dryness may also have have been an underlying factor in the winters of 1932, 1933, and 1937, which all set numerous all-time cold records still not equalled, eg. Austin having, in January 1937, an Average temperature for the entire month of an even 0.0 degrees F. (this is really cold, 4 degrees colder than the January average in Fargo, North Dakota)... Austin is a tiny place in a high mountain valley east of John Day and Prarie City. Climate Change Notes comparing the 1930s to Recent Times---- the existence of global warming has been endlessly argued, and the following data will help illustrate how confusing things can be. The 1930s in Oregon established Oregon's all-time record low and also many other winter cold records that still stand--- so one is surprised to learn that the hottest-ever summer in U.S. history occurred in 1936, with an average summer temperature (June 1-Aug. 30) of 74.73 degrees F (period of record 1895-2005)........ The Nation's third hottest summer was 1934.. Astoundingly, 1933 nationwide was the sixth hottest summer ever recorded (73.59 degrees F)!... As a matter of fact, 5 out of the 10 hottest summers ever recorded in the U.S. occurred during the 1930s! Meanwhile, only 4 out of the 10 hottest-ever summers have occurred since 1990. Thus, during the 1930s, U.S. weather experts might have been convinced that Global Warming was taking over, but, if they had lived in Oregon, they might have been drawing an opposite conclusion! No More Record-Setting Cold and Snowy Winters? Some thoughts on Global Warming Theories vs. the Coming new Ice Age. Why haven't there been any extreme cold winters in recent years (eg. the last really extreme arctic air Cold Wave in Seneca was over 20 years ago, 48 below zero in 1989)? Portland's last year with anything one might call a "real" snowstorm was probably 10 years ago, in 1993. (click for page with Deep Portland Snowfalls) ----Note: as of early January 2009, Portland has now racked-up a very impressive snowfall record, the winter so far becoming the third snowiest by some measures, coming in well behind the huge winters of 1949-50, and 1968-69 (note, also, that the severe cold that accompanied those other two winters has been lacking, and the coldest temperature of the period was 20 degrees, recorded on three occasions shortly before Christmas). Are extremely cold winters a thing of the past-- with Global Warming being the culprit? Below is a quotation from the NCDC (National Climatic Data Center), which was used in George Taylor's book, "The Climate of Oregon" (1999). The 1999 quote states that NCDC researchers have not found clear evidence for global warming, but there is a noteworthy trend: "... There has been a clear trend in recent decades, however, to fewer extremely low minimum temperatures in several widely-scattered areas..." A similar trend has been posited by George R. Miller in his new book, "Pacific Northwest Weather, But My Barometer Says Fair!" (Frank Amato Publications, 2002). Mr. Miller notes a major reduction in winter snowfall in both Portland and Seattle since records began in approx. 1870, eg. ten year periods in the early portion showing over FOUR times as much snowfall as recent ten year periods! (winters 1880/81-1889/90 had 196 inches of snow, whereas winters 1980/81-1989/90 had a paltry 40 inches).... Click for more thoughts on Global Warming as it might be affecting Oregon. "....Sunrise on the Columbia* between Portland and Astoria presents a wonderful sight, according to those who came on the early train from Astoria. The river is frozen and in billows, reflecting the color of the sunrise, as do the frozen waterfalls along the way." ..(*The mighty Columbia River is 1,240 miles long, and ranks as one of the United State's largest rivers). For a better sense of just how cold Oregon got in December 1924, click here to see what happened in far southeastern Oregon at the hamlet of Riverside! "Temeratures over the entire State were far below normal, and precipitation was much above. The major portion of this precipitation fell in the form of snow and sleet even in the western division (eg. Willamette Valley). In Portland a total of 32.9 inches of snow fell during the month....Severe blizzard conditions on the 13th and a heavy sleet and ice storm on the 18th-19th together caused several hundred thousand dollars worth of damage and virtually halted traffic for two or three days over widespread areas, particularly in western Oregon...." George Taylor adds, "...All highways west of the Cascades and through the Columbia River Gorge were closed due to large snow drifts." (First quote is from the 1950 Annual Climatological Summary, written by E.S. Ellison, and second quotation is from The Oregon Weather Book by George Taylor. ) Click here for more on Winter 1950. Finally, bringing us to a more recent time, let's not forget the winter of 1968-69. This winter featured a brutal double-whammy of snow in January. In total there were 18 days with one inch or more of snow on the ground, with snow up to 9 inches deep during the first period, and up to 10 inches deep in the second! Kids were in heaven and snowmen almost out-numbered people by the time the long snowy period ended. OREGON in the New Millenium, 1989-Present, things really warming up! I camped once at the peaceful little Joaquin Miller wayside area south of Seneca. Here's a picture from that time, back in the mid-90s. Parallels between Lavoy Finicum and Joaquin Miller? Miller is listed in the Oregon Blue Book as a "Notable Person" --Miller was born in 1837 in Indiana of Quaker parents. In 1852 Joaquin and his parents made the dangerous overland wagon trip to Oregon, settling near Eugene. By about 1854, he was in California gold mining. Here the Blue Book notes, "He later survived other battles with northern California Indian groups, and had several altercations with the law over matters relating to the ownership of livestock and gun play." This gun-totin' phase of Miller's life apparently over, he returned to Eugene and studied Law, becoming an attorney in 1861 and soon a newspaper editor: "In his newspaper, The Eugene City Democratic Register, he pleaded for an end to the Civil War, adopting the Quaker creed of his father." But this city existence did not last. The Blue Book reports: "In 1864 he drove a herd of cattle across the Cascade Mountains to Canyon City where he planted the region's first orchard and served as Grant County Judge until 1870." His time in Eastern Oregon is probably a main reason that Joaquin Miller Wayside was named for him.... But the talented man did not stay in the remote reaches of the West. I will quote again from the Oregon Blue Book: "Miller's work Songs of the Sierras was published in Great Britain during a visit in 1870-1871. He returned to the United States to great acclaim for his writing and lived in San Francisco for a time before traveling in Europe and Asia from 1873 to 1880. He resided in New York and Washington D.C. until moving to Oakland, California where he lived from 1885 to 1897. Oakland remained his home intermittently until his death in 1913. Miller's colorful life included stints serving as a newspaper correspondent during the Klondike Gold Rush in 1897-1898 as well as the Boxer War in China in 1899." "Among his other works of poetry and prose were My Life Among the Modocs, Unwritten History, In Classic Shades, and A Royal Highway of the World."